The Pastor's Wife Does Cry! There are some things in this life I have wanted and desired but never the pastor of my church. We have had some handsome ministers over the years who headed up our congregation but never once have I thought I must have him. Better still never have I ever disrespected the pastor's wife either. 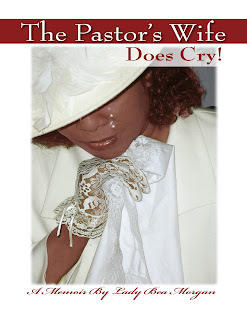 I recently published A Pastor’s Wife Does Cry! Honestly I must say that I have reviewed & published many books but none ever affected me as this one did. As I read this book I went through many emotions like anger, happiness, and sadness and even I wanted revenge. The book is about a first lady of a large church. She discussed her feelings and mistreatment at the hands of supposedly Christian women whose primary objective was not to walk through the pearly gates of Heaven but to ride the minister and not like in a car. Pam is a member in the church. Claxton Morgan is the Pastor. Pam drove Claxton to all of his preaching engagements, Pastor’s anniversary services, and funerals. When we held funerals, she drove him to the cemetery when he could have ridden in the hearse. All of these acts of foolishness were done without me; sometimes without my knowledge or consent. Pastor Morgan was held up so long on Sundays with his clique. I would wait for him so that we could eat together. He started saying, “Just put me some food up, I’ll eat it later.” When he came home he’d say, “I’m not hungry” or he’d say, “I don’t have a taste for anything right now.” Then I learned that he was going out to eat every Sunday with his armor bearer and a few other ladies. That was deception! That was the beginning of the end of our family meals together.The Pastor’s Wife Does Cry! Another passage from the book is when two friends ended their relationship because each was vying to win the pastor. Airika betrayed her friend Willimina, to become friends with my husband. Isn’t that a wonderful friend to have? She started cooking for him. I don’t know how much of her cooking he has had, but I do remember her sending Claxton, by one of the ministers, one slice of lasagna and one half slice of Texas toast. I was sitting in the car with one of our members who had ridden with us to hear the Pastor preach. The minister handed me the food and told me who it was from. She just hugged me inside of the church and said, “Praise the Lord, First Lady.” She could have handed me the food. She was really trying hard to get his attention. At one of our banquets, she wore a sleeveless spaghetti strapped dress with no jacket or shawl. After the program was over, I saw her standing near Claxton, looking over her shoulders every few minutes to see if he was looking at her. The Lord brought it to my attention. What and who was she waiting for, “I thought?” He was busy shaking hands and thanking people for coming and she was steadily waiting. When we finally left, we congregated in the lobby of the hotel, you know how we do, and we ended up standing outside in front of the hotel. Airika began walking to her car and then she yelled to Claxton as he was talking to the members, “Pastor! Quit watching me walk! I see you, you can’t keep your eyes off of me.” Everybody looked and she kept walking knowing that everybody was looking at her and thinking about what she had said. Claxton was too embarrassed. That statement was also made to make me think that she and Claxton had something going on. Now don’t get me wrong, I was mad at the Pastor for allowing his wife to be mistreated and disrespected. He turned a blind eye to things because he enjoyed the attention or for whatever. I was angry at the church members for totally disrespecting this lady while pretending to be Christians. I was equally pissed at the first lady for standing back and letting these women destroy her marriage. To me she didn’t fight or intervene because she believed that God would handle it. After all, HE said revenge is mine. The pastor’s wife was living as a Christian woman. She did not step out of her role based on her words. I guess that is why I am not a pastors’ wife because I would have been a strong woman to contend with and they would have felt my wrath.This book was written by Lady Bea Morgan who is still a first lady in the church. It can be purchased from Amazon.com.